According to a 2003 report by the Department of Defense (DoD), there are currently more than 10 million acres of land on around 1400 DoD sites that are thought to contain unexploded ordnance (UXO). Clearing this land of unsafe materials is currently a very time consuming and expensive task. It is estimated that it would cost tens of billions of dollars to check and clear all of the possibly affected land. The DoD currently spends more than $200 million a year on UXO related problems. Auburn University in partnership with the Army Corp of Engineers Huntsville Center with initial funding from the Environmental Security Technology Certification Program (ESTCP) and with continued funding from the Huntsville Center’s Innovative Technology Program have developed a robotic digital geophysical mapping (DGM) tow vehicle. The goal of the project is to increase safety, productivity, and accuracy of the geophysical survey process by using autonomous vehicle technologies. The platform is capable of towing an array of industry standard DGM sensors in either tele-operated or semi-autonomous modes. It has been used to collect geophysical data with Geonics EM61-Mk2 time domain metal detectors, Geometrics G-858 magnetometers, and the GAP Geophysics TM-5Emu but is capable of towing most any sensor package. The AUXOS software system consists of two main applications. A server app written in C++ that runs on the vehicle and handles sensor interfaces, vehicle control, and data logging. A second user interface application written in C# and VB.net runs on a remote PC. This app allows the system to be configured and controlled, data and video from the vehicles to be displayed, and provides mission planning capabilities. A screeenshot of the user interface in mission planning mode is shown in the image above. A TCP/IP connection using a custom interface is currently used to communicate between the user interface and vehicle. The system is, however, currently being converted to use the JAUS standard. This will allow interoperability with additional vehicles in the future as well as making the system more easily extensible. 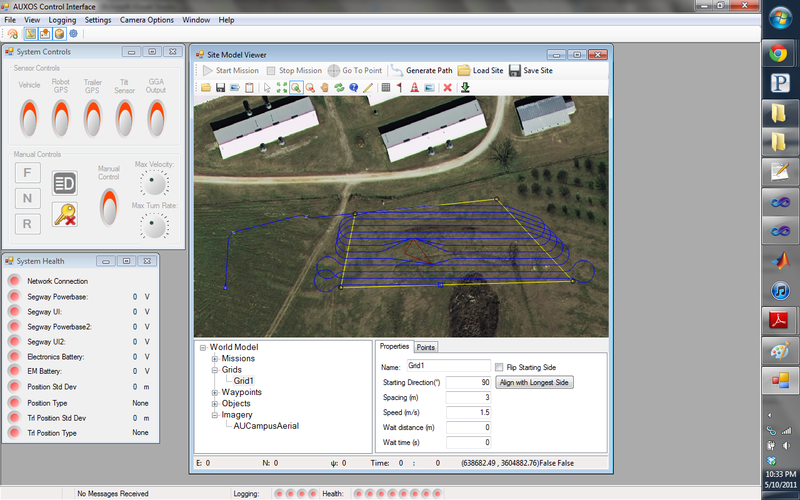 The mission planner include in the AUXOS user interface application allows for paths to be specified in multiple ways. The main methods for planning paths is by defining waypoints for the vehicle to drive through or polygons for the vehicle to survey. The system also has the capability to generate more specialized paths that are specific to geophysical surveying (such as 6-line tests). 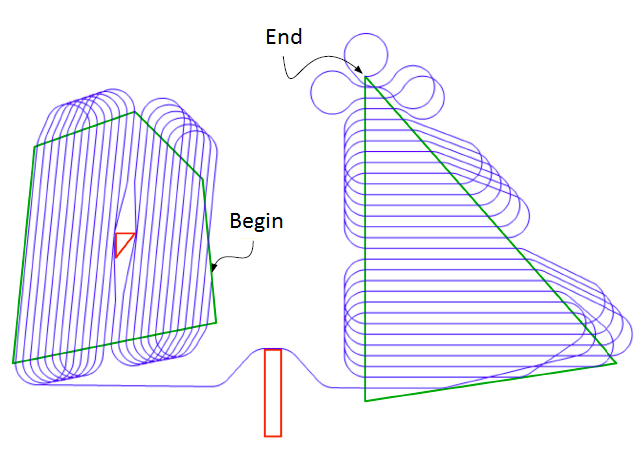 The planner also allows polygonal obstacles to be defined and avoided. Obstacles are avoided by searching a visibilty graph using a Dijkstra search algorithm. An example path that covers two grids while avoiding obstacles within them is shown in the image below.